“Khepera is known as the Becoming One, the ancient scarab beetle who pushes the solar orb above the horizon at dawn. 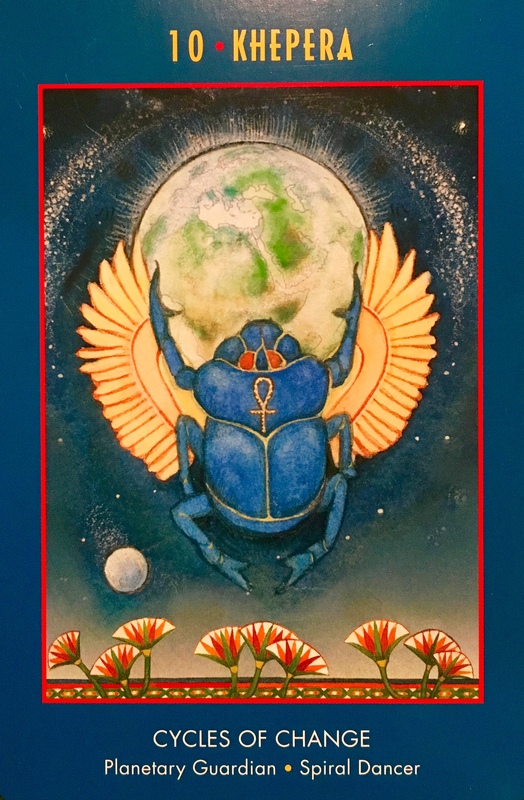 The scarab represents the gentle rays of the morning sun and is closely associated with creation and resurrection. Khepera is a loyal guardian and protector of planet Earth and all her creatures. In tune with the cycles of life and the cosmos, Khepera ceaselessly works to bring forth the necessary changes that allow creation to keep moving forward. As a Spiral Dancer who filters and transmits the powerful stellar and cosmic forces that radiate onto our planet and into all of Earth’s creatures, Khepera mitigates these energies while holding the balance of time and the turning of the ages in his feet. If you have drawn this card, it is time to increase your awareness of the more subtle energies that are influencing you. You are encoding the mystery teachings of the spiral dance and the nature of change, and Khepera is there to protect and support you during this quickening. It is through the intercession of Khepera that you are able to handle the energies that are moving towards you at any given moment, especially as you move off the linear path into a deeper relationship with the natural cycles of creation. With the heightened awareness the Khepera offers, you can become a co-creator of your universe. You are awakening to how transformation happens and being prepared for the next level of higher consciousness. If your situation requires protection, feel the energies of Khepera surround and enfold you, especially when you find yourself in a physically or emotionally toxic environment. We are so much more than the drama of the story we are living, and part of ascension is to transcend that story to find a better way. Higher consciousness is about our deep connection to the Universe; to All That Is. It is being able to see the Divine Light in all; it is about rising above the chaos and it is about returning to simplicity and deep knowing. We have been lead astray for too long and it’s time to release all that and come back to ourselves. we no longer need to conform in order to fit in. We no longer need to hide our Shadow selves from the world fearing judgment or rejection. And we no longer need to compete or measure ourselves against another. It’s time to lift each other up, not keep each other down. It is time to stand up for what we believe in, believing with absolute conviction that if we do so, it will make a difference. It is time to release the fear, the limitations and the old patterns. It is time to get back into alignment with our Soul path. To rise up into our true authentic selves. Knowing that we are protected, that we are encouraged, supported, loved and provided for. It is safe to return to being you, after many lifetimes of denying your true Soul self. Rise up, and take the reins.